a) He Who visibly manifests Himselfthrough His incarnations. c) He who elevates His devotees to His level. a) SrI BhaTTar interprets this nAma andthe subsequent few nAma-s as describing the arcA form of bhagavAn. In this context, he interprets the nAma "udIrNah" as "ullasitah"which means "shining, bright, becoming visible" and gives the meaning"He has a pleasing and splendid form that is clearly visible to the eyes ofthe devotee". samudriktatvAt udIrNah" - He who is superior to all beings. SrI satyadevo vAsishTha derives thewords starting from the upasarga "ut" and the root Ru - gatau - to go,and gives the meaning - One who is above all beings. Alternatively, hesays that the nAma can signify that He is udIrNah because He lifts everyone up. SrI kRshNa datta bhAradvAj essentially gives the same explanation - ut -abhyudayam, Rccahati - prApayati sma eva sadaiva svASritAnAm iti udIrNah. Thus, he also derives the nAma from ut, and the root R - to go, and gives themeaning that bhagavAn is called udIrNah because He lifts up His devotees so thatthey reach Him. The dharma cakram writer illustrates atdifferent levels how bhagavAn is superior in all respects. In sheer sizeof His form, He permeates everything, and everything is His body, so there is noone who has a bigger form than Him. In superiority of Power, we knowthrough His incarnations that there is no one superior to Him in His Power. In the area of controlling indriyas and mind, bhagavAn is the yogISvara, andthere is none superior to Him in this aspect also. In the area of Love toeveryone, bhagavAn demonstrated that there is none equal to Him in this aspectby His leelA-s in gokulam. When it comes to knowledge, there is nothingmore to know for one who has known mahA vishNu; since He is the ultimate inknowledge. Thus, no matter what aspect one looks at, there is nothingsuperior to Him. This nAma should reveal to us this great and at the samesimple Truth, and thus lead us to meditate on Him. a) He Who is visible to the eyes ofall. b) He who has eyes everywhere, and sees everything through His consciousness. a) SrI BhaTTar: He issarvataS-cakshuh because He is visible to the likes of even ordinary people likeus. He has been visible to the people of His time when He took incarnationas rAma, kkRshNa, etc., and He is visible to us today in the form of arcA mUrtiin the temples and in our houses. This again supports His beingchinna-samSayah as we saw in nAma 629. He delights His devotees with Hiscomplete darSanam. b) SrI Samkara: He issarvataS-cakshuh because He has eyes everywhere, and thus sees everythingthrough His consciousness. Sarvatah sarvam sva-caitanyena paSyatiiti sarvatS-cakshuh. Through His caitanyam which is natural to Him, Hesees everything always. The Sruti says - He has eyes on all sides -viSvataS-cakshuruta viSvatas-pAt (SvetASva. a) He Who is not the Master. b) He Who has no one above Him as the Master. a) SrI BhaTTar: He is calledanISah since when it comes to His devotees, He does not assert or display Hisrulership, and instead, is completely subservient to them. We already sawseveral examples of this in our explanation of the nAma 627 - vidheyAtmA. SrI v.v. rAmAnujan presents this idea more graphically by pointing out thatbhagavAn becomes dependent on the likes of us to bathe Him and feed Him in HisarcA form! PeriAzhvAr describes this act of His becoming dependent on Hisdevotees thus - AycciiyAgiya annaiyAl anRu veNNei vArttaiyuL sIRRamuNDu azhukUtta appan (tiruvAi. 6.2.11). He just puts up a show of weeping andcrying to show how subservient He is to yaSodA at the very thought that she mayget angry at the remote suggestion that He may be involved in any reportedincident of butter being stolen. The dharma cakram writer points outthat the lesson to take from this nAma is that one who is devoted to bhagavAnhas bhagavAn Himself under his control, and so devotion will lead one to thestate where there is no one who will be a master of the bhakta. This isthe greatness of devotion or bhakti. 633. SASvata-sthirah - He Who iseternally existent and steady. SASvata means eternal, always, andsthirah means stable. SrI BhaTTar: He assumes thevarious forms of the images (arcA forms) which continue to exist for ever andwhich are directly perceptible to the eyes, at all times. SrI BhaTTarquotes from the sAttvata samhitA - bimba AkRtyA AtmanA bimbe samAgamyaavatisThate - "He assumes a form similar to that of the image (fashioned byus), enters into it and remains there". The reference here is to thearcA mUrti-s.
SrI Samkara: Even while beingEternal, He is also unchanging and stable - SaSvat bhavannapi, na vikriyAmkadAcit upaiti iti SASvata-sthirah. The dharma cakram writer points outthat when our mind is involved with things that change, our likes and dislikesare also changing. For example, if we get attracted to a body that isyoung, we lose the attraction when the body becomes older. But if weinvolve our mind with paramAtmA, who is never changing, there is no question ofour changing constantly between likes and dislikes. One who involveshis mind in the Supreme Self also attains eternal and stable piece, knowledge,and love. The likes of us who have an impermanent body and live in thisimpermanent world can attain permanent peace and permanent joy by meditating onthe etrnal and stable Self - the SASvata-sthirah. This is the significance of this nAma. b) He Who lay on the sea shore on His way to SrIla'nkA. d) He in whom the whole world rests at the time of pralaya. a) Continuing his interpretation of the current set of nAma-s in terms of HisarcA incarnations, SrI BhTTar gives the vyAkhyAnam to the current nAma asfollows: He is called bhU-Sayah since He defers to the request of Hisdevotees to appear in this world, and makes His appearance in different formssuch as svayam-vyakta, siddha, mAnusha, etc., and even stays put in these placesby lying down there permanently in order to bless the devotees. svayam-vyakta forms are those where the Lord has chosen to manifest Himselfwithout the effort of anyone; siddha are those forms where the image of the Lordhas been consecrated by siddhas or perfected beings (such as brahma etc. )., andmAnusha are places where the Lord is installed by ordinary human beings. SrI P. B. aNNa'ngarAcArya describes his anubhavam of bhU-Sayah as "He Whojust stubbornly lies down and stays wherever His devotees ask Him to be",which is the best I could translate from his tamizh sentence "anbargaLuganda iDa'ngaLil paDu kADu kiDappavar". b) SrI Samkara gives reference to Lord rAma's resting on the sea shore whileproceeding to SrI lankA for destroying rAvaNa. c) SrI cinmayAnanda gives an additional alternate interpretation – He in whomthe whole world rests at the time of dissolution - bhUh Sete asmin iti bhU-Sayah. d) SrI satyadevo vAsishTha gives the interpretation that since He rests in allthings that exist in the form of antaryAmi, He is called bhU-Sayah - bhUshu Sete. Thus, in summary, the nAma bhU-Sayah is enjoyed by the different vyAkhyAna kartA-sin various ways: a) He responds to the devotee's wishes by lying downwherever they install Him in the form of acrA mUrti, so that they can worshipHim easily; b) He is called bhU-Sayah because He lied down on the ground(on the sea shore) on His way to SrIla'nkA; c) He lies in the heart lotus of allthe creatures as their antaryAmi; d) All the creatures (referred to by the termbhU here), rest in Him (Sayah) at the time of parlaya. He Who becomes adorned, orHe Who adorns. 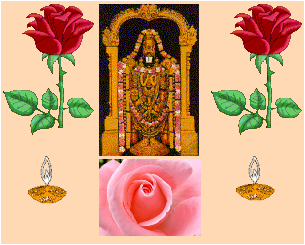 The literal meaning of the term bhUshaNam is "decoration, adornment,ornament". bhUshaNah is thus One who is decorated or adorned, or onewho decorates or adorns. The different vyAkhyAna kartA-s give differentanubhavams of what he is decorated with, or what He decorates with. a) SrI BhaTTar looks at His saulabhyam as His most important bhUshaNam - Hiseasy accessibility to His devotee. The act of climbing down from Hisparatvam to the level of His devotees and mixing with them, is only bhUshaNamfor Him and not a dUshaNam. b) SrI v.v. rAmAnujan gives the additional explanation in terms of His divyabhUshNa-s as described by emperumAnAr in SrI SaraNAgati gadyam: kirITa makuTa cUDAvatamsa makara kuNDala graiveyaka hAra keyUra kaTakaSrIvatsa kaustubha muktAdAama udara bandhana pItAmbara kA'ncIguNa nUpurAdiaparimita divya bhUshNa - He is decorated with all sorts and kinds of ornaments,most wonderful to behold, ever-lasting, faultless, sweet-smelling, soft totouch, wonderful with splendor, such as the crown bearing the central diadem oflustrous stone, other head ornaments, ear ornaments, necklaces and neckornaments, garlands, shoulder-bracelets, bracelets in the hands, SrIvatsa andkaustubha, pearl garlands, waistlets, lace cloths, gold waist band and legornaments and others precious and innumerable. c) SrI Samkara views His taking the numerous incarnations at His wish asHis act of bhUshaNam or adorning this world - "sva icchA avatAraihbahubhih bhUmim bhUshayan bhUshNah". SrI rAdhAkRshNa SAstri gives theexample of bhagavAn decorating gokulam by His very presence. d) SrI satyadevo vAsishTha gives the example of the soul or AtmA being in thebody as itself a decoration or adornment of the body. When the soul leavesthe body, the body becomes unattractive by the second. Similarly, bhagavAn is the adornment for the whole world. Thatwhich is the life of something is the bhUshaNa for it as well. Forinstance, bhagavAn is bhUshaNa for the universe in the form of the sun and inthe form of the antaryAmi of the sun. e) SrI cinmayAnanda gives the interpretation that He makes this world beautiful(adorns) with the varieties of His creation. He gives love and other finerinstincts, and He is the One behind all great, noble, and beautiful thoughtsthat have enriched human life. The dharma cakram writer points out that all the different kinds of beautiesthat we experience in nature (through sound, sight, touch, thought, intellect,etc. )., are present in Him. In His form as kRshNa, He was exquisitelybeautiful to see, the sound of His flute stole the hearts of all the gopi-s, the bhagavad gItA that He gave us is the incarnation of knowledge, His characteris absolute perfection, etc. The same is true of His incarnation as Lord rAma. LordrAma's divine beauty was well-known, the Rshi-s were immensely moved by thebeauty of His character, vAlmIki lost himself in the nAma of rAma, and hanumAnlost himself in His service. BhagavAn is thus the bhUshaNa above allbhUashaNa-s to His devotees. The different interpretations for this nAma are thus based on: a)His being decorated or adorned with qualities that are beneficial to Hisdevotees; b) His being adorned with all different kinds of beautiful ornaments;c) His adorning this Universe with all kinds of beautiful creations andequipping them with qualities such as love and intellect, and above all, givingthem the vital force of life by being their antaryAmi; d) His adorning theUniverse through His different incarnations, and thus decorating the place whereHe is by His very presence. a) He Who is wealth to Hisdevotees. b) He Who is the personification of Glory. c) He Who is the cause of all glory in His creations. d) He Who exists in the forms of all His creations. The root from which the nAma can be derived is bhU - sattAyAm - to be, to live,to be born. The nAma can also mean vibhUti - wealth. SrI cinmayAnanda quotes amarakoSa - vibhUti bhUtir_aiSvarye. The other amara koSa definitions arebhavati iti bhUtih, and bhavati anayA SrImAn iti bhUtih, which support thetwo meanings indicated. The different interpretations for this nAma arecentered on these two meanings. a) SrI BhaTTar explains that He is the wealth in every way to those who havetotally surrendered to Him, and so He is called bhUtih. nammAzhvAr captures this sentiment in tiruvAimozhi 5.1.8: "SelEi kaNNiyarum perum Selvamum nan makkaLum mElAt tAi tandaiyum avarE iniAvArE" (SrI v.v. rAmAnujan). SrI kRshNa datta bhAradvAj echoesthe same idea in his interpretation - paramA sampath bhaktAnAm iti bhUtih. b) Among the interpretations SrI Samkara gives are: a) BhavagavAn iscalled bhUtih because He Himself is the embodiment of Glory (vibhUtih), or, b)He is the cause of all glories in all His creations, or the source of allglorious manifestations - sarva vibhUtInAm kAraNatvAt bhUtih. c) SrI satyadevo vAsishTha gives the interpretation that bhagavAn iscalled bhUtih because He exists everywhere in the forms of all His creations, inthe forms of the sun, the stars, etc. , and He also is the cause of all theglory that His creations display. d) The dharma cakram writer gives the interpretation that bhagavAn is One who isthe personification of greatness. He observes that thesignificance of the nAma lies in our realizing that we should not go after thetransient and false greatness that comes with impermanent and materialisticbenefits, but instead, learn tomeditate on Him in thought, word, and deed so that we aim towards therealization of that One True Greatness. He Who is without sorrow. SrI satyadevo vAsishTha gives the derivation - vigatah Soko yasya sa vi-Sokah,or avidyamAnah Soko yasya sa a-Sokah. (SrI kRshNa datta bhAradvAj: na Soko yasya iti aSokah nitya Ananda mayah). a) SrI BhaTTar continues to stress bhagavAn's concern for the devotee in everyone of his interpretations. For the current nAma, his interpretation isthat bhagavAn has no need to be sorrowful because He never abandons any anAthawho has no other help and seeks His help. b) SrI Samkara continues to stress bhagavAn's paratvam, His being withoutblemish, etc. For the current nAma, his interpretation is that bhagavAn isGriefless, being absolute Bliss. One might raise the obvious question: Lord rAma was struck with extremesorrow when He was separated from sItA. How can one say He is withoutSokam? SrI rAdhAkRshNa SAstri gives the explanation straight from SrImadbhAgavatam 9.10.11 - Lord rAma went through this act in His role of showing usall how ordinary mortals who are attached to a woman dear to them behave: priyayA viyuktah strI sa'nginAm gatimiti prathayanS-cacAra. SrI cinmayAnanda observes that it is because of disturbances at thebody-mind-intellect level that one experiences sorrow. Since bhagavAn isbeyond these agitations, He is ever Blissful, desireless, ever contented, andthus never experiences sorrow. SrI kRshNa datta bhAradvAj quotes from chAndogyopanishad in support of thevyAkhyAnam for this nAma - ya AtmApahatapApmA vijaro vimRtyur-viSoko avijighatsoapipAsah satyakAmah satya samkalpah sonveshTavyah sa vijij~nAsitavya. (chA. 8.7.1), wherein one of the many attributes of Brahman is given as viSokah. a) SrI BhaTTar gives the interpretation that He removes the sorrow of thedevotee who suffers from separation from Him, by helping the devotee cross theocean of samsAra. SrI v.v. rAmAnujan observes that while all wealthin this world causes sorrow, He is the only Wealth who removes the sorrow. How does He do that? SrI rAmAnujan refers us to tirumazhiSai AzhvAr'stiruccandaviruttam 115: attan Agi annai Agi, Alum empirAnumAi, ottu ovvAdapal piRappu ozhittu nammai AT-koLvAn - He becomes the devotee's whole Wealth, Hebecomes the devotee's Father, Mother, and Lord, gets into the devotee's heart,and redeems the devotee from the ocean of samsAra, and thus removes thedevotee's sorrow once for all. "Of those whose minds are thus focused on Me, I become soon their saviorfrom the ocean of mortal life". The dharma cakram writer points out that when there is moham (attachment), theresult is Sokam. Thus, to be rid of Sokam, one has to overcome attachment. This is accomplished by meditating on bhagavAn. He gives the example ofarjuna. gItA begins with the expression of Sokam in arjuna's mind becauseof his moham or attachment to all his relatives and AcArya-s, whom he faces inthe battlefield. Because of this Sokam, arjuna loses his heart completely, hisbow is slipping from his hand, his mind is tired, he is unable to stand up, hisbody perspires and he is shivering with nervousness. The whole gItA isimparted to arjuna by bhagavAn just so he can overcome his moham and thus hisSokam. At the end of receiving the instruction from bhagvAn, He asksarjuna if he has overcome his Sokam because of the realization of the truth, andarjuna confirms that by listening to His instructions, he has been able toovercome the Sokam. The lesson to take from this nAma is that bymeditating on Him we can overcome Sokam.